A disaster movie with a galaxy of stars trapped on a submerged airliner, Airport '77 is as corny as can be expected but also surprisingly well produced. Aging tycoon Philip Stevens (James Stewart) invites high profile guests to travel on his lavishly outfitted private Boeing 747 en route to the grand opening of his home-based museum. 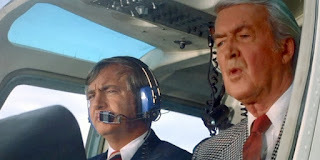 Captain Don Gallagher (Jack Lemmon) is in command of the flight, while Eve Clayton (Brenda Vaccaro) is Don's long-time lover and in charge of passenger comfort. The guests include Nicholas St. Downs III (Joseph Cotten) and Emily Livingston (Olivia de Havilland), who first met in the 1930s and are reunited on the flight. Businessman Martin Wallace (Christopher Lee) and his neglected and perpetually drunk wife Karen (Lee Grant) are also on the flight, as are Stevens' daughter Lisa (Pamela Bellwood) and her young son. In the cargo hold is a large collection of expensive art, and this attracts a band of thieves under the leadership of co-pilot Chambers (Robert Foxworth). Over the Bermuda Triangle the criminals release a sleeping gas to knock out Gallagher and all the passengers, and Chambers changes course, flying below the radar towards an uninhabited island. But in dense fog the 747 clips an off-shore oil rig, the plane crashes into the sea and sinks to the sea bed, intact but leaking. Gallagher has to keep the passengers calm and find a way to notify rescuers of the plane's location while the Navy and Coast Guard mount a search operation. 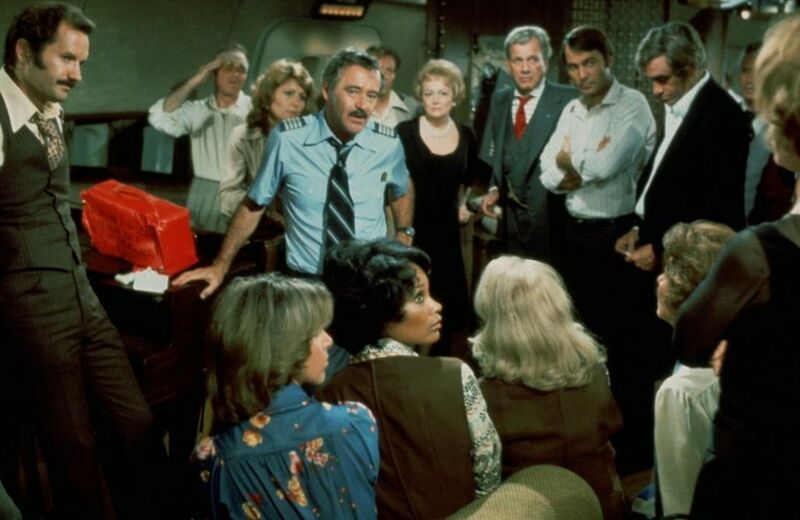 Directed by Jerry Jameson, Airport '77 arrived relatively late in the cycle of 1970s disaster films. By now the formula is overly familiar: collect a bunch of mostly elderly Hollywood stars, place them in peril, and play a parlour game of who lives and who dies before the credits roll. While everything about the film is conventional, the production values are well above average, yielding a mixed experience where the content is tired but the packaging is slick. Disaster movies tend to work better in confined spaces, and the coffin-under-the-sea premise is appropriately claustrophobic and generates a real sense of danger, with water slowly seeping into the plane, and the passengers threatened with both drowning and asphyxiation. The film's ambitions are reflected in a superior cast deep in veteran talent. Lemmon and Cotten are most prominent and get to run around the bowels of the cavernous plane and play the role of heroes. The likes of Stewart, de Havilland, Grant and Lee ensure that as irritating as the passengers are, they are good at being irritating. George Kennedy makes his obligatory disaster movie appearance, but this time is limited to a more minor role as a rescue coordinator. The special effects are decent for the era and have survived the test of time. The final act transforms into a propaganda piece for the rescue capabilities of the Navy and Coast Guard, and although again the cheese factor is odorous, the execution is polished. Jameson keeps the pacing tight, delivering the drama in under two hours, and the final acts of tactical implementation, heroism, and late-in-the-day death are completed with requisite precision. Airport '77 is definitely all wet, but enjoys its time in the cinematic tub.